Pack 12 Berkeley-Ashton is teaming up with the Cumberland Fire Department to organize an Annual Adopt-A-Hydrant Program. Residents are being asked to consider volunteering their time to clear snow within three feet of hydrants and open up a path to the street. The First Annual Adopt-A-Hydrant signup is scheduled for December 3rd at the Hayden Center, 9-12pm. A fire truck will be on hand for kids to tour. There are 1,067 hydrants spread across Cumberland and the goal is to have each one “adopted” by a resident to help ensure they are ready for use in an emergency. Currently, the Cumberland Fire Department clears as many hydrants as possible, but the task is overwhelming. Residents also clear nearby hydrants on their own, which is very much appreciated. The Cumberland Adopt-A-Hydrant Program has a goal of making this important task more organized and effective, clearing as many hydrants as possible. The Fire Department advised residents to wait until the storm finishes before shoveling and to wear bright colored clothing. 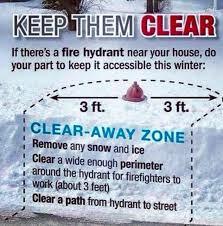 In an emergency, every second counts, help our firefighters this winter season by clearing hydrants.